Select your camera model, select the desired recording mode (zoom, 1080p, 720p) which determines the pixel subsampling mode, pick an aspect ratio and frame rate. Ideally also type in the max. writing speed of your SD/CF card measured by magic lantern (otherwise it uses the limit of the SD/CF interface which might not be achievable with your card). If you miss a feature or something doesn't seem right please let me know. The pixel width given by the calculator might not be selectable in magic lantern on your camera since it currently doesn't offer finer grained selection (the calculator allows for all multiples of 32 while magic lantern only has a subset of those selectable). I tried to include as many quirks and limits for each listed camera (max crop recording sizes, no 1080p mode on EOS-M, fps limitations of 500D, ...). Please report any inconsistencies and additional quirks! Can u add ability to calculate run time per card size? Great job! Great idea - and done. Added a snippet on how many minutes a 32GB card will be good for. I would like to see something like this calculator into ML as a separate module, or better yet, inside MLV module as a menu option... I would code it myself, but I'm too busy atm... I will see it.
? There is a calculator included. Each time you choose resolution and/or change ratio and/or frame rate you will see bandwidth required. A personal experience is about select the lens for the shoot. For example, a medium shot could be nice with a 50 mm than 85. As you know, exist an optical tool to do this. And is very expensive. Maybe could be a very nice option in live view, pressing a button an select the crop factor lens to know how could be your shoot: 24 MM, 35, 50, 85. This one was an old idea when I see the graphical representation by @DeafEyeJedi. Nice tool, thank you ! Maybe can you add 60D ? Nice... Even works on my mobile. @b) 2512 is probably the actual max - but mlv_rec only allows multiples of 32 (like my calculator), so everything is correct now. Great tool and working offline ! I've copied the 2 files to my phone and tablet and it's working with Chrome ! But how do you set up the subsampling in Magic latern ? It solved my problem! Til 5 minutes ago I though I had a poor card, as I could not reach the limits with my 50D - looking hard at your table I realised I had been shooting 30 fps and comparing it to your limits at 24 fps! Canon 50D today, with Lexar x1066 64GB, in crop mode managed over six minutes with no frames skipped at 1728 x 1080, aspect 16:10, I stopped the recording myself. Regarding the framing, open my calculator again and look at the rectangle that shows you the portion used of the sensor. 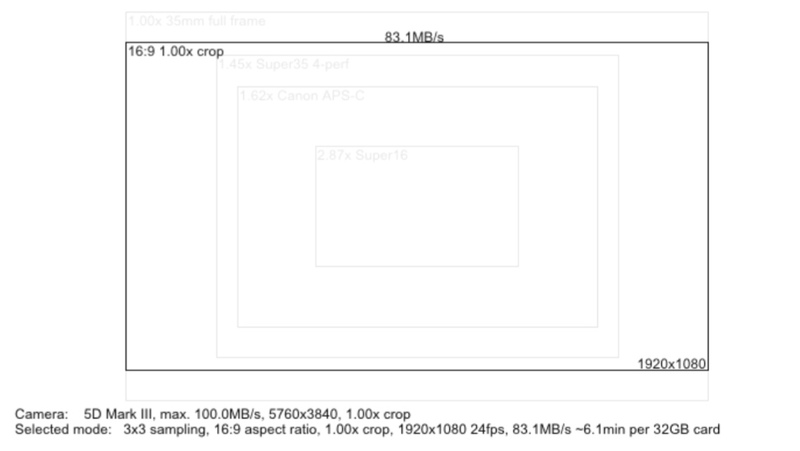 Of course you have to comapre it to the APS-C sized grey frame to see how much/little of the full sensor area you're using. Also the calculator gives you the crop factor with which you can multiply your lens focal length with to get the effective focal length. Also there are some settings regarding framing indicators in the ML mlv settings, play around with those. Now 1728x1080@24fps for 6mins is about 75MB/s. Are you sure those are your settings and really no frame was dropped? I thought the theoretical limit of the 50D interface is about 70MB/s and you exceeded it by quite a bit. Regarding the video I am reasonably sure - I did not check the frame numbers (did not extract frames) for anything missing BUT the recording stops when a frame is dropped, doesn't it? I mean I have seen this message several times when trying to record at 30 fps and the recording would always stop after a few hundred frames once the message was displayed. And I did not change any settings regarding this. I still have this video, so if there is anything you would like me to check, (even upload - but I do not know where to upload - it is almost 30GB - 8957 frames) then I will. I watched it through MIRawViewer. There is also a MRX file - I do not know what are the info inside, is there an information about frames ? Or is there any other method to check the frames apart from extracting and counting? Confirmed. I have just converted the files using raw2cdng.1.6.5. which resulted in 8957 consecutive frames. One strange thing, though. MIRawViewer v.1.4.3 states: 1728 x 1080 23.976 FPS, 8957 frames, BUT when I open .dng in RawTherapee 4.2.147 the actual image size appears to be 1720 x 1072. Any ideas? I have just managed to record 8393 frames (no dropped frames) at 1792 x 1080 at 23.976 fps (according to ML settings and MIRawViewer, but extracted dngs are 1784 x 1072).